Some Marshall football fans might find the trials and tribulations of the WVU football program an entertaining carnival to watch lately. However, the real takeaway from this complete debacle is to have a better understanding of human behavior when dealing with personnel matters. Oliver Luck, whom all called brilliant when he came in as WVU's Athletic Director, has quite possibly done himself in due to a lack of basic awareness of what makes coaches tick. 2. But if I get rid of Stewart, a significant portion of the WVU fan base will revolt. So what to do? Luck could have bellied up to the bar and said that the WVU program needs taken to another level. In such a move, he would have been freed to bring in a Holgorsen or whomever, having a unified command at the Head Coach position, while trying to let Stewart down easily. After all, he is a beloved figure by a goodly portion of WVU fans and deserves respect for his contributions in the post-Rodriguez football program. Luck would have taken a lot of heat from Stewart's fan base, and that's not a small consideration for an Athletic Director who wants to keep peace in the family to maintain strong season ticket sales and general support. But at least he'd be free to move forward with a new Head Coach. Alternatively, Luck could have kept Stewart on but followed up with the order he gave Stewart midway through the season last year, namely to find a new Offensive Coordinator. Luck could have supervised that selection, bringing a potential heir apparent to Stewart as a warning that, if the pace didn't pick up this year, the Athletic Director could exercise his options. And if Stewart happened to have an exceptional year, then Luck could choose to keep him on further. Those are the two scenarios we've heard most frequently as the better plays that Luck, a former standout WVU quarterback, could have chosen to run. In both cases, Luck would have given himself more options, rather than painting himself into a most difficult corner with two strongwilled men, both of whom consider themselves the real boss when it comes to WVU's offensive strategy. Many hoped that Stewart's generous compensation package would have been enough to buy his silence on the whole arrangement. Certainly, when one takes that kind of money from an institution, one is expected to be a company man and play ball. 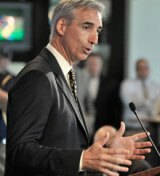 But Oliver Luck, whose job requires him to think of money all the time (e.g. beer sales at the stadium) hoped that Stewart's honor could be bought. In terms of a business transaction, which this really is at one level, Stewart is in breach if the reports are true about him backstabbing Holgorsen. However, Luck's lack of a common sense understanding of human nature was the first breach here. Luck comes out looking like a man who thinks only with his head and never with his gut. Meanwhile, Stewart is all heart, with the good and bad that brings. Did Luck really expect him to be able to swallow this one, even for a big paycheck? Anyone raised in West Virginia could have told him that when you cross a proud, older man who doesn't want to retire yet, your options are clear: you can thank him, give him a gold watch, and run for cover. Or you can keep him and work it out somehow. Half measures and dimmer switches don't work in such emotional situations. Now Luck gets to try to put Humpty Dumpty back together again. Good luck, Luck. You've jumped in bed with two head coaches: now lie in it.